Trains provide a nice way to travel around mainland Greece. Trains don't go to that many places, but for the destinations they do reach, trains are far superior to the wretched Greek bus system. The ΟΣΕ or Οργανισμός Σιδηροδρόμων Ελλάδος (Organismos Sidirodromon Ellados or OSE), the Hellenic Railways Organization, operates all inter-city passenger rail service in Greece. Get a copy of the Δρομολογια (dromologia, or train schedule). You will want to get a current schedule at the train station. The times change, and there are many more stops than those in the below schedules. The below is just listed for you to consider day trips to Corinthos, or trips to/from Olympia, Patras, Corinthos, and Athens. The city names are listed in Greek, be ready to deal with that. Bold columns below are Inter-City trains, nicer and faster. Well, at least less slow, given that we're talking about narrow-gauge Greek trains. Since the Greek economy is based primarily on strikes and graffiti, there is a really good chance that you will arrive at the Athens airport and find that both the Metro and the bus system are not running. In that case, you can take two rides on the Προαστίακος or Proastiakos suburban train to get within hiking distance of central Athens. 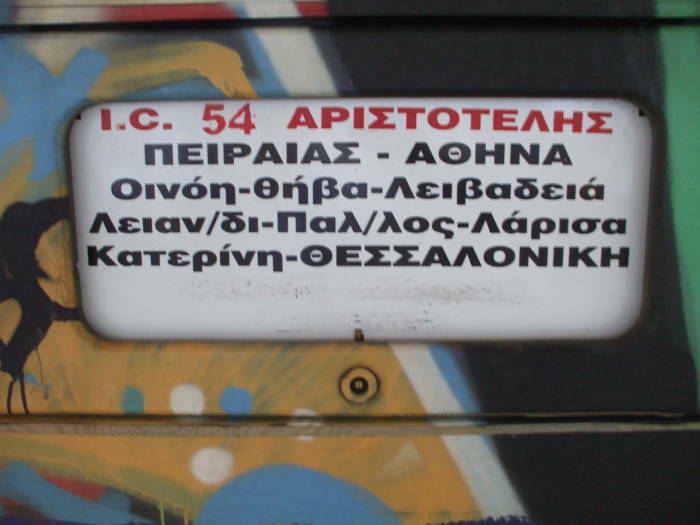 Unless, of course, the Proastiakos is also on strike. 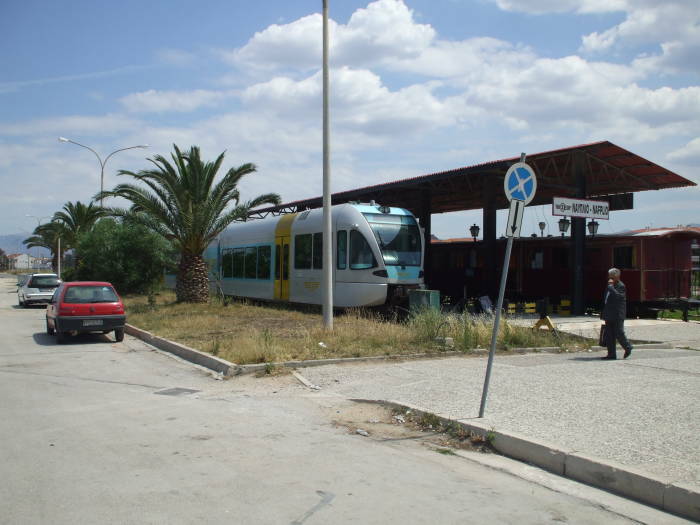 Προαστίακος or Proastiakos suburban train. Let's start by going to Athens' Larissa train station. Athens has a plan to open a brand new train station, oddly named the Central Train Station despite its location twenty kilometers north of the city center, at Arhanon. Yes, I realize that the current year is 2019, but there are still a lot of Greek projects that they hope to finish, some day, in preparation for the 2004 Olympic Games. Greece hopes to open this new station before the 2004 Olympic Games. 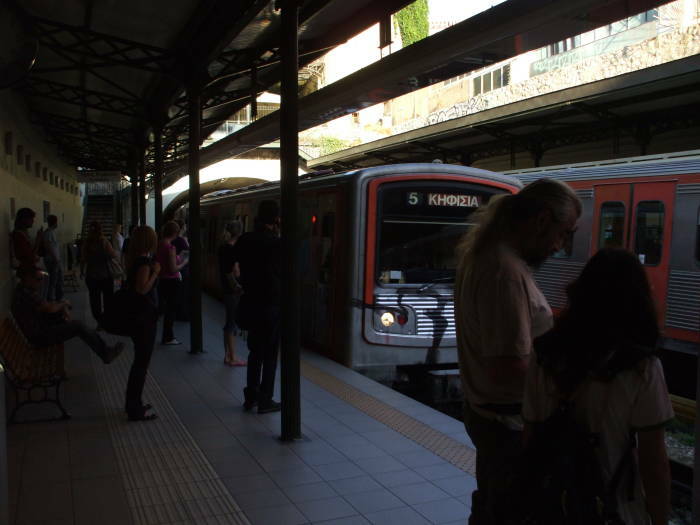 The Athens Metro now has a station at the Larissa train station, let's take the Metro! 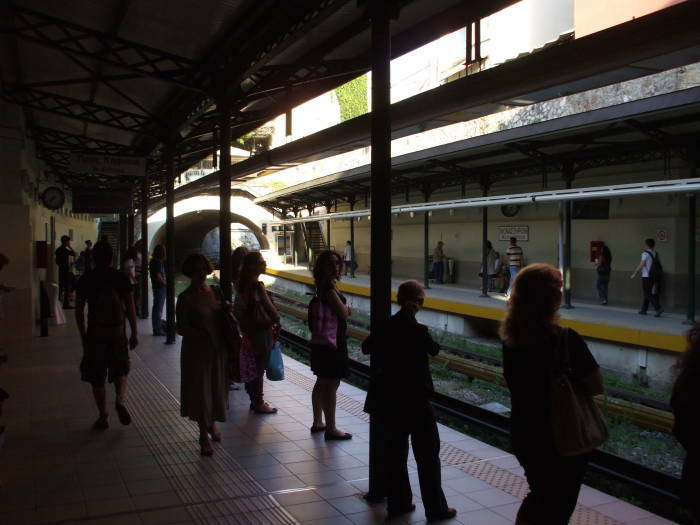 This is the Monastiraki station, in the Plaka district below the Acropolis. This is on the #1 Line. We will take it for one stop, to Plateas Omonias, where we will change to Line #2 for two stops. 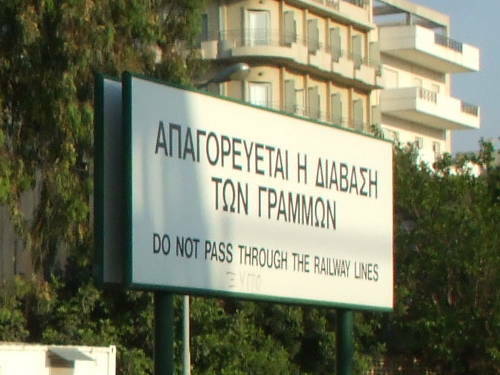 The line through the Monastiraki station is open to the sky in places. 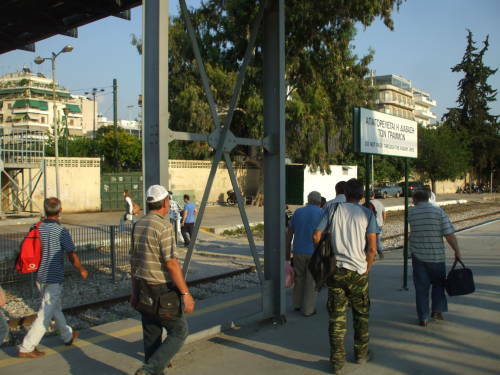 This line runs south to Athens' port of Piraeus, and much of the line from here south is above ground. Monastiraki station in the Athens Metro system. The train arrives at the Monastiraki station. Here comes the train! You can see from its destination board that we got onto the correct platorm. It is headed north to Κηφισια. 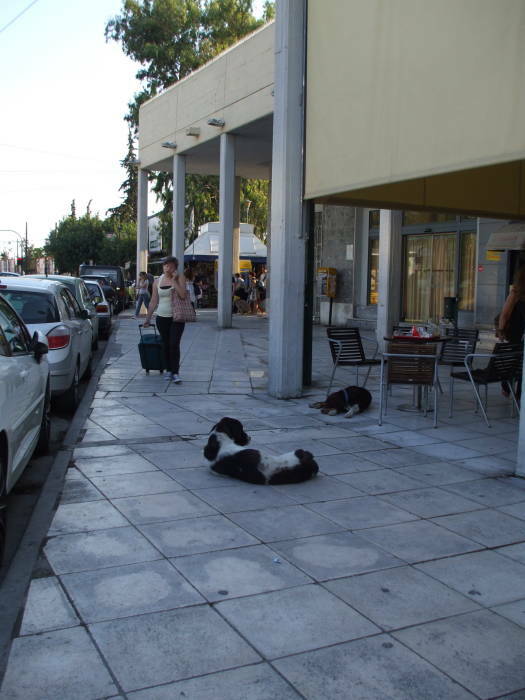 Climb up out of the Metro at the Larissa station and step over the sleeping dogs and into the station. Apparently old Αεσοπ was inspired to write his aphorism about letting the sleeping dogs lie while strolling around Periclean-era Athens. 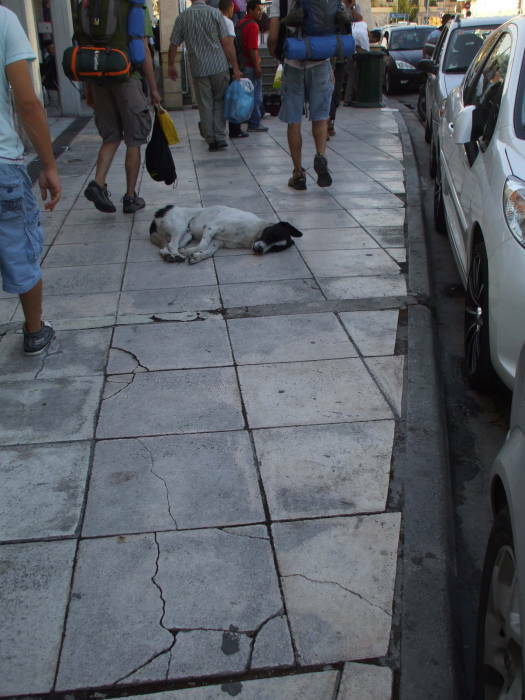 The stray dogs in Athens, like those in most cities, are very mellow. The belligerent ones tend to get eliminated by the authorities and the local people. They also learn very quickly to sleep with their tails tucked under and their paws together. Buy your ticket inside the station and head out to the platform. For the local Greek experience, join all the locals walking across the railway line right below the sign forbidding that activity. DO NOT PASS THROUGH THE RAILWAY LINES. Below, I have taken a train from Athens to Kalambaka. Kalampaka. Kalabáka. Whatever. The Greek city's name is Καλαμπακα. Greek is said to be spelled phonetically, and I guess it is so long as you accept a rather complicated set of rules for dipthongs and other sound shifts caused by combinations of letter sequences. The Greek letter Β is pronounced like English V. To get a B sound, you need to use the Greek letter combination ΜΠ. So, literally letter-by-letter, Καλαμπακα would be rendered Kalampaka. Using the ΜΠ→B transition, it would be Kalabaka, or Kalabáka to indicate stress. Or, since B is a voiced version of P, really sort of like sounding both M and P simultaneously, why not Kalambaka? Train in the Kalambaka station. 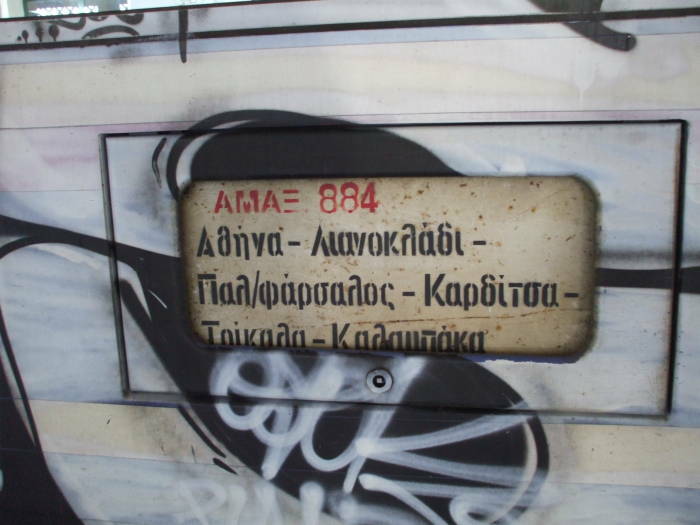 Anyway, train #884 leaves Athens Larissa station at 0821 and arrives in Kalambaka at 1303, having stopped along the way at Θήβα, Λιανοκλάδι, Λειβάδια, Λειανοκλάδι, Παλαιοφάρσαλος, Καρδίτσα and Τρίκαλα. Alternatives include train changes at Palaiofarsalos. The OSE web site can provide schedules. Nafplio is in the opposite direction from Athens, to the south, along the east coast of the Peloponnese. Train in the Nafplio station. 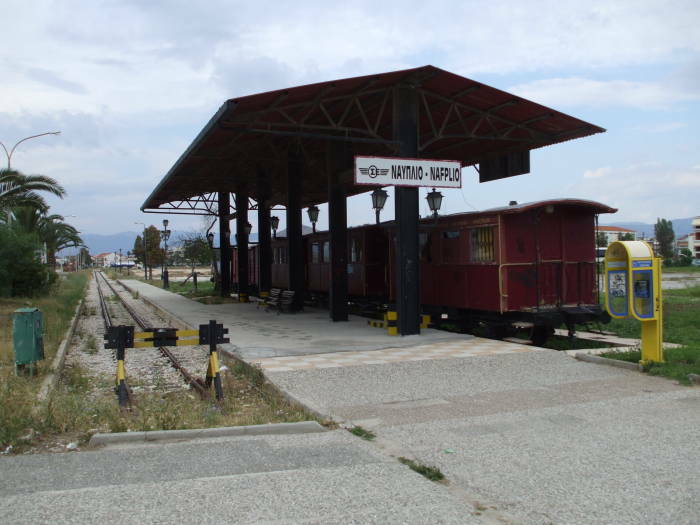 Here is one of the small self-powered trains in the Nafplio station. 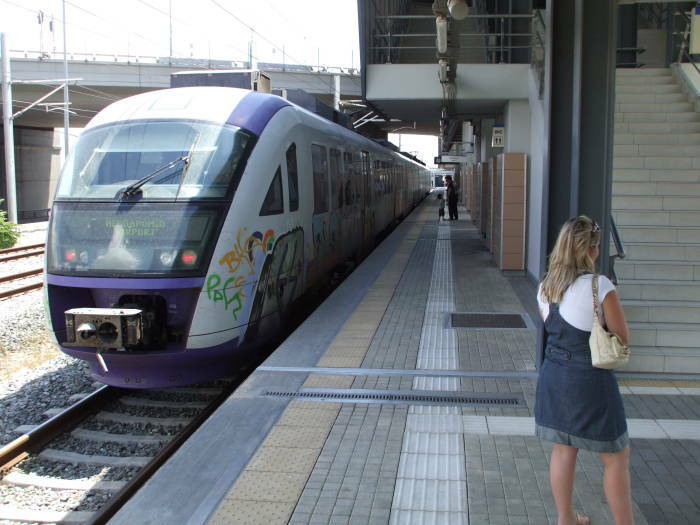 The history of the Greek railway system explains its somewhat sorry state. Plans were presented to the Greek government in 1835 to build a railway line from Athens to its port of Piraeus, just 8.8 kilometers of track. A contract was signed and work started in 1857, some 22 years later. Then it took twelve more years, until 1869, for those 8.8 km of track to be built. In 1881 the Prime Minister at the time, Alexandros Koumondouros, signed four separate contracts for building rail lines using the European standard gauge of 1,435 mm. The goal was to make Greece a crucial part of the transporation links from Europe to India (plus, of course, at least for Koumondouros, the goal of getting rich by being the guy who signed those contracts). Koumondouros was replaced as Prime Minister by Charilaos Trikoupis in 1882. Trikoupis immediately cancelled those four contracts and replaced them with four new ones of his own. 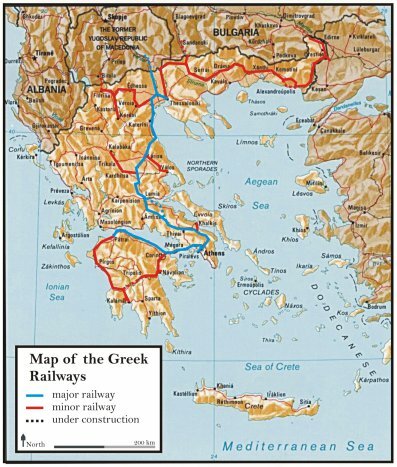 Trikoupis' plan was to build some lines to the European standard gauge, plus a narrow-gauge loop around the Peloponnese and a second system in Thessaly, in central Greece. Trikoupis figured this could be completed in five years, but it took twenty-five. Greece is still plagued by a mix of different rail gauges. 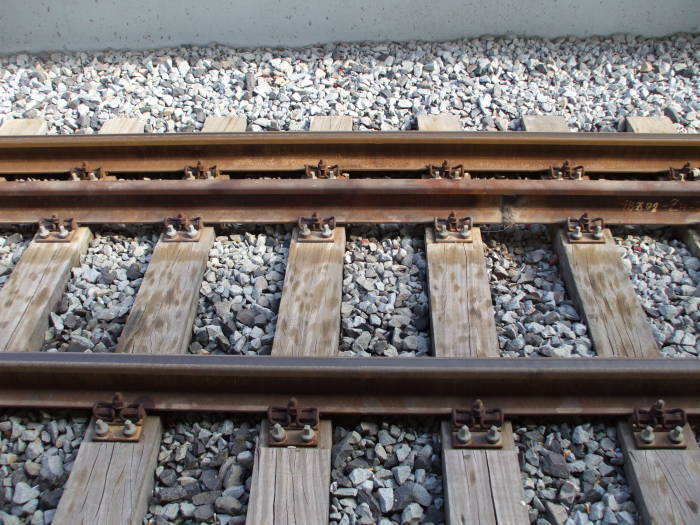 Cars and locomotives can only travel on sections of track built to the gauge of their wheel sets. Athens' Larissa station connects to the standard gauge lines, generally leading north to Thessaloniki and Europe. Just across the way, maybe 200 meters' walk, is the Peloponnese station and the narrow gauge lines running south and west. A project is underway to replace the busy narrow gauge line running south and west from Athens through Corinthos to Patras. That will move the standard-to-narrow gauge interface from Athens to Corinthos and Patras. This is yet another project that they hope to finish in time for the 2004 Olympic Games (and yes, I realize that the games happened 15	years ago). 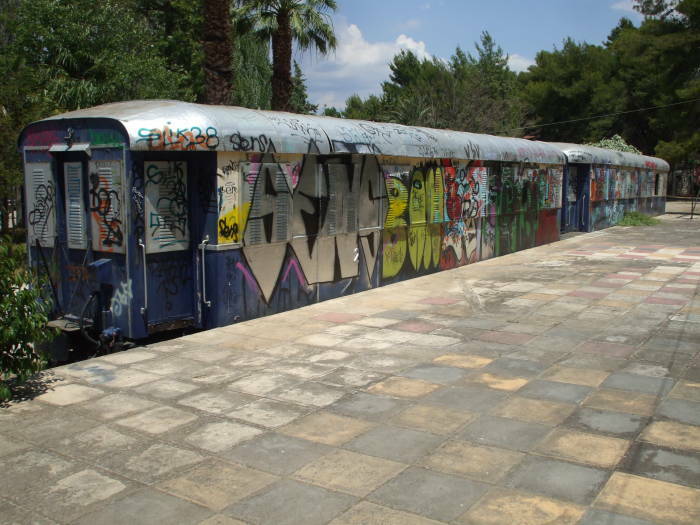 Rail car in Nafplio's central park. Nafplio's station used to be in what is now a park at the center of town, before it was moved down by the waterfront. This car is preserved at the former station site in the park as a commemoration of the Greek railway system. The interior vandalism is almost entirely of the non-paint variety. 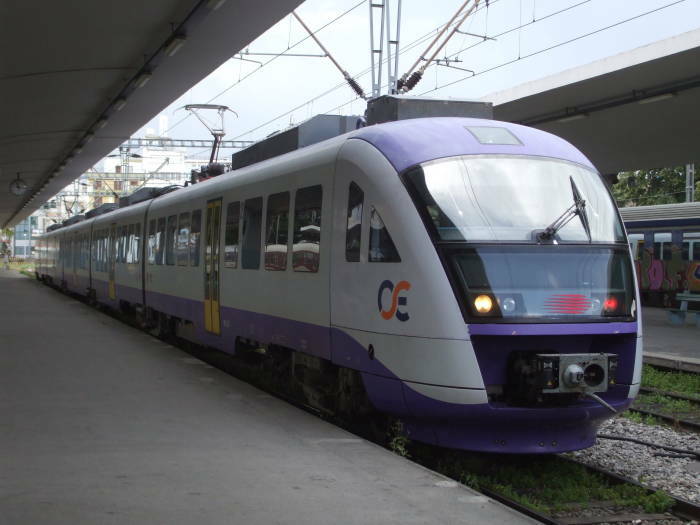 This is one of those short self-powered trains at the Corinthos station. Its wheel sets are narrow-gauge, 1,000 versus 1,435 mm. Narrow gauge passenger car at Korinthos. 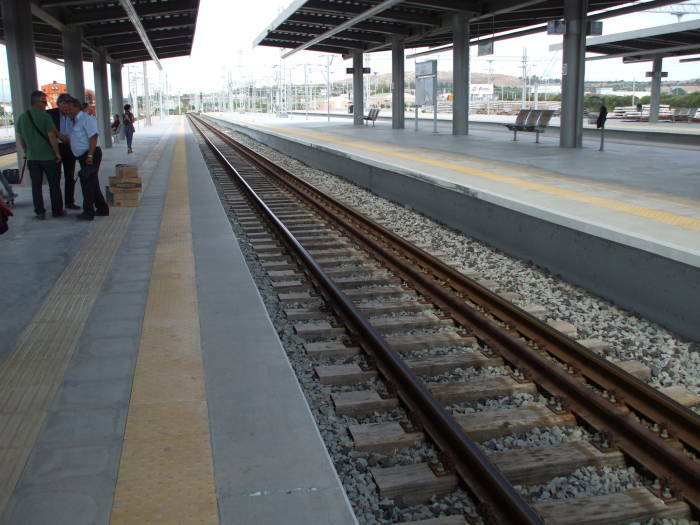 Dual gauge rail line at Korinthos. 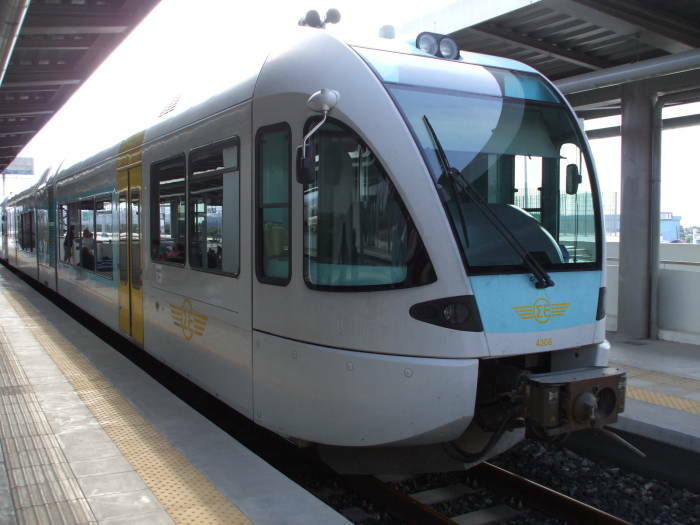 Korinthos is now one of the interfaces between the narrow and standard gauge rail networks. The lines through the station are built to support trains of both gauges. A narrow gauge train runs on the near and middle rails. Standard gauge ones run on the two outer rails. 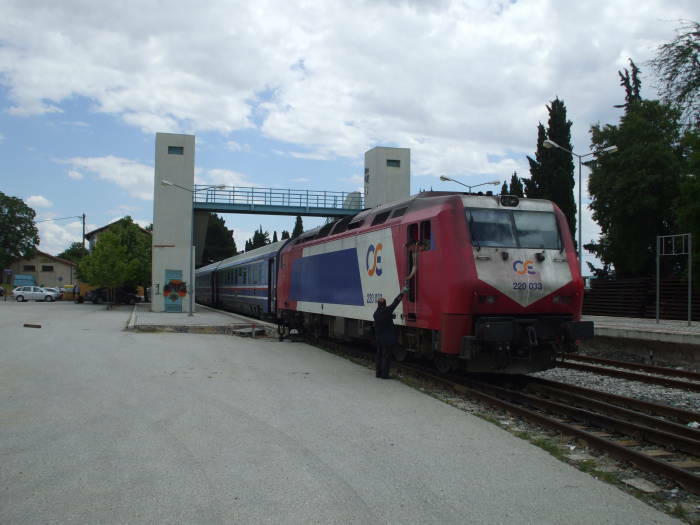 A Προαστίακος (or Proastiakos) suburban train with standard gauge wheels runs all the way from Korinthos into Athens. 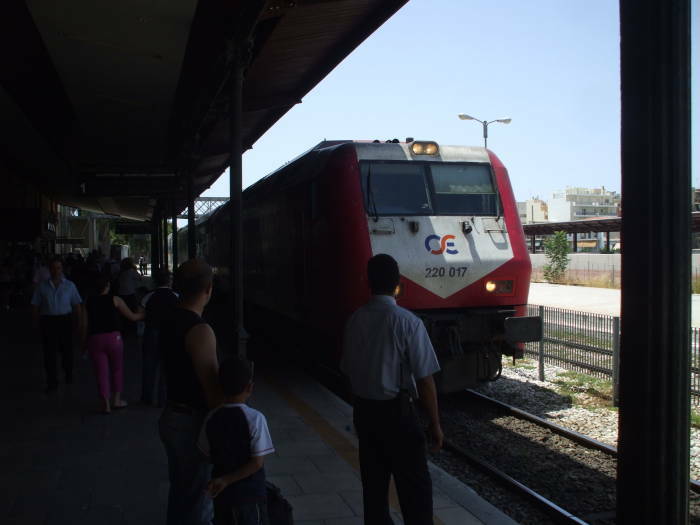 The Aristotelis train is pulling into the Athens station as it starts its run to Thessaloniki. This is InterCity train number 54. It starts at the port of Piraeus and makes the run north in a relatively quick five hours and ten minutes. The Aristotelis train pulls into Athens, bound for Thessaloniki. 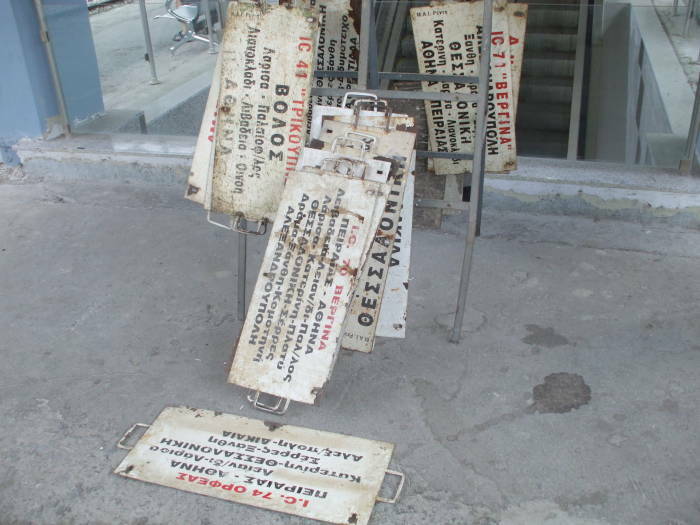 Once you get to Thessaloniki, you might be able to buy onward tickets to Belgrade, Sofia, and Istanbul, which the Greeks persist in calling Constantinople. That is, you might, but only if Greece re-establishes its international rail connections. 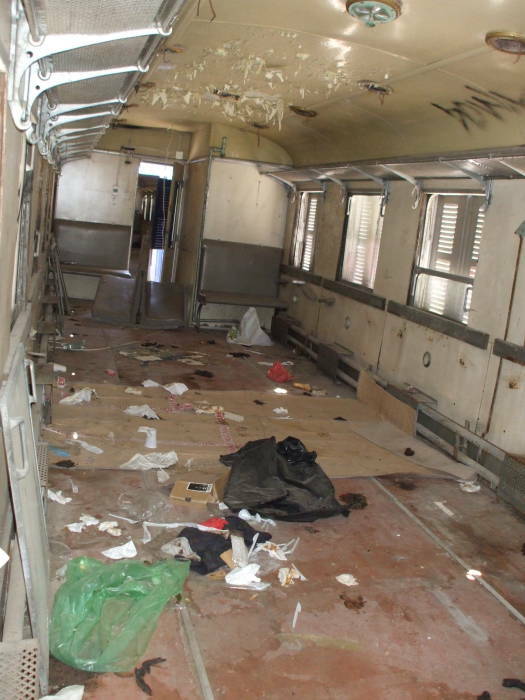 In February 2011, in reaction to the ever worsening Greek economy, all international rail service was halted. How can it help an economy to cut yourself off from all neighboring countries? You'll have to ask Greece for an explanation of that one. 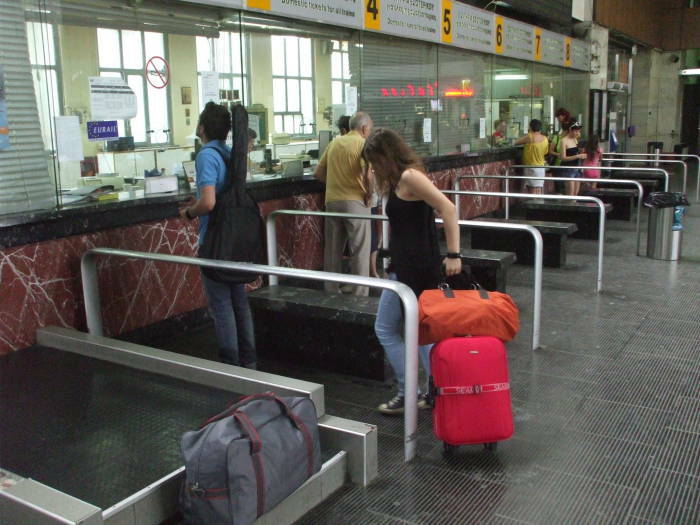 Even if the trains are running, you cannot buy sleeper tickets from Thessaloniki to Sofia in advance at the Athens station, even if you ask at its international ticket window. If you will arrive in Thessaloniki late one afternoon and you don't plan on leaving until midnight of the following day, maybe 30 hours later, sleeper compartments should still be available. 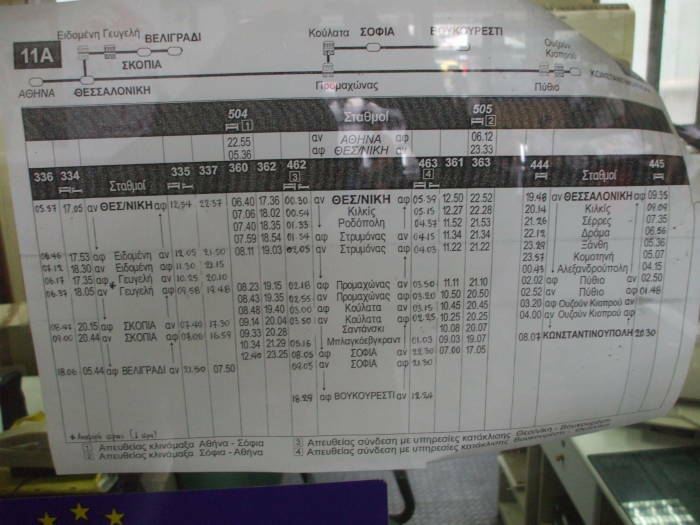 Schedules from Thessaloniki to Belgrade, Sofia, and Istanbul. Ticket windows at the Thessaloniki station. The ticket windows have the usual stone bench-like things intended to enforce some semblance of order when things get crowded. They weren't needed on this day. 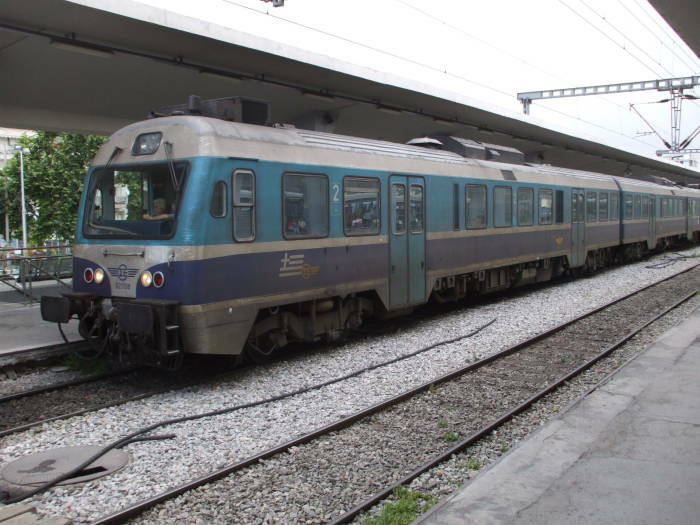 This typical Greek passenger train is sitting at the platform at the Thessaloniki station. These route placards await their trains. This is a new passenger train for short to medium length runs. 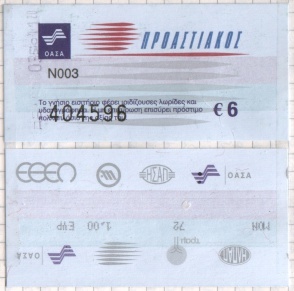 Proastiakos suburban train ticket, front and back. 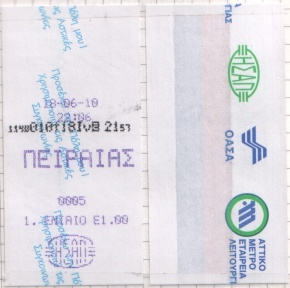 Athens Metro ticket, front and back.